Cause of Death: Crushed by a boulder attached to a chain after Malcolm Dragon slams it on him. 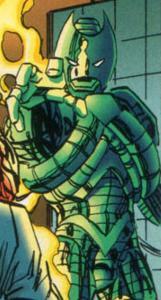 MegaTech was one of a group of Vicious Circle members that were sent by OverLord to assassinate CyberFace, who was in the custody of the Chicago Police Department at the time. Dragon and his fellow officers managed to defeat the villains but not without heavy casualties. MegaTech returned during the Gang War and eventually began working for the very man he had previously tried to kill. As his service with the Vicious Circle continued, MegaTech accompanied dozens of his colleagues on an assassination attempt on Dragon. They were all shrunk down to a miniaturised state with a Martian weapon and would spend a couple of years like this. He eventually regained normal stature thanks to Vicious Circle scientists. MegaTech was most recently seen accompanying the Vicious Circle on a raid of Hillman Hospital where they stole a unit of Dragon’s blood, leading to the Dragon Army’s creation. MegaTech later joins part in a group of Vicious Circle members who attack a monster Malcolm Dragon and MegaTech is killed when he is crushed by a boulder that is attached to a chain being used by Malcolm Dragon.